Abstract: Our study has shown that AcuGraph, when used and interpreted properly, could be another non-invasive tool for monitoring a patient’s treatment progress. If feeling “better” is not good enough then seeing the coloured bars produced on a computer screen would be more convincing. Truly AcuGraph is a state-of-the-art, objective method of evaluation. Patients generally want to know if they are making any progress with their treatment. Towards this end, doctors would send patients for mammogram, X-ray, MRI, CT, PET or Bone scans. These procedures cost money. Apart from that, anything that involves radiation might not be good for cancer patients. We do not encourage our patients to undergo such procedures unless it is absolutely necessary. However, if patients think that by performing such imaging procedures makes them happier or sleep better, so to say – so be it. Generally we ask patients to do the relevant blood tests as a way to monitor their progress. This is non-evasive although it may not tell the story entirely. When patients come to CA Care for follow up consultation, our first question is: How are you? Or how do you feel? Or, are you getting any better? We ask these questions because patients themselves ought to know if they are getting better or otherwise. Their bodies should tell them. But to some people “feeling better” is not good enough. If possible, they want something more high-tech or objective. In late 2009, we were fortunate to learn about the AcuGraph, a digital meridian imaging device (1). 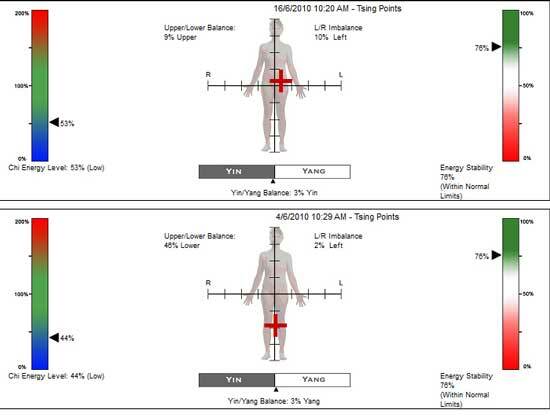 AcuGraph provides information about a person’s meridian energy balance. According to Chinese Traditional Medicine, the meridian is the main channels through which qi and blood circulate (2) . Qi animates us and gives us life. Symptoms of various illnesses are manifestations of disrupted, blocked, or unbalanced qi movement resulting in excess or deficient Qi. So the theory of qi allows practitioners to treat disharmonies or problems while they are still energetic in nature. Once an imbalance is detected it is possible to correct it through the use of acupuncture, herbal remedies, exercise, diet and lifestyle. As balance is restored, so is health. Figure 1: Taking readings from 24 points of the fingers and toes. Sandy (not real name, H277) is a 52-year old female. Sometime in 2006, she had pains in her abdomen. She consulted doctors at the government hospital and was told nothing was wrong with her. The pain persisted for more than a year. She eventually had to be admitted to a private hospital and was diagnosed with cancer. An operation was done. This procedure cost RM 5,000.00 After surgery Sandy received six cycles of chemotherapy. Each cycle cost RM 2,300.00. According to her family she was always ill after the chemotherapy. In early 2008, the cancer recurred. She underwent a second operation. This surgery cost RM 7,000.00. 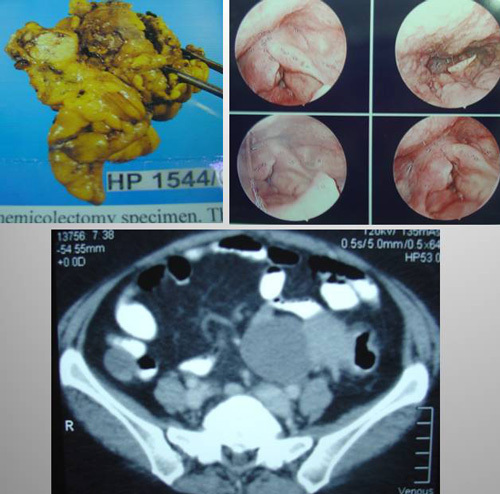 The histopathology report indicated an adenocarcinoma of the ovary that had spread to the caecum and omentum. No chemotherapy was indicated this time. Sandy seemed to be well after the surgery. A 2 cm enhancing area in the spleen. An ill defined 3 x 2 cm lesion adherent to the tail of spleen and splenic artery. Slight hydronephrosis and hydroureter on the left down to L5/S1. A lobulated 7 x 4.5 cm lesion at L5/S1 position. A 6.5 x 3.5 cm lesion in the left adnexa and indenting the rectosigmoid colon. A 3 cm lesion in the right adnexa. Conclusion: Fatty liver with pelvic and mesenteric metastasis with obstructive left renal system. Splenic metastasis. Sandy was asked to undergo chemotherapy but she refused. She came to seek our help on 28 February 2010. She presented with occasional diarrhea. She had winds in her stomach. She was prescribed: Capsule A, C-tea, Utero-ovary 1 and 2, GI One and T & E teas. On 5 March 2010 – one week on the herbs, she felt good. There was no more diarrhea. The problem with stomach wind had improved. On 2 April 2010, she reported no more pains in her lower abdomen. Before the herbs, there were pains. She felt better and stronger. Her sleep was better than before. Her stools continued to be normal. Her breathing returned to normal, before the herbs she was breathless. When Sandy and her family first came to see us in February 2010, we recalled the mood that day was rather tense and gloomy. Sally broke into tears knowing that the cure for her cancer was rather remote. However, after some months on the herbs, she came in always smiling. The AcuGraph reading on 20 August 2010 (Figure 2) shows a better “tuned” meridian energy than the one done on 18 June and 2 April 2010. The yin/yang, Upper /Lower and Left / Right energy were well balanced on 20 August 2010 compared to readings taken on 18 June and 2 April 2010 (Figure 3). Tam (not real name, M783) is a 61-year-old male. In 2006, he vomited blood and was diagnosed with liver cirrhosis. He was prescribed Baraclude (entecavir), an antiviral medication for treating chronic hepatitis. In 2008, Tam had stone in his kidney. In June 2010, his stomach bloated and he was jaundiced. An ultrasound indicated liver cirrhosis. The medication he was taking was not effective after all. The doctor prescribed more drugs: Ursofalk, Cefasily, Baraclude, Ganaton, Gasec and Tenvir. On 16 June 2010, Tam came to seek our help. He presented with uncomfortable stomach due to wind. He had diarrhea 5 to 6 times a day. He urinated once every 2 hours. He felt heaty, thirsty and appeared rather yellow due to jaundice. Tam was prescribed Capsule A and B, LL-tea, Liver 1 and Liver 2 tea and Heat Jaundice tea. A month later, on 23 July 2010, Tam returned for more herbs. His condition had improved. He had more energy, his appetite improved and his diarrhea had stopped. His urine was clear – no more yellow. His stomach was not bloated anymore. On 20 August 2010, Tam came back to see us again. He appeared much improved and was happy and satisfied. He had no complaints. He told us that while taking the herbs, he also took Baraclude which the doctor had prescribed him earlier. He asked if he could stop taking it. This drug cost him about RM 600 per month. The following are the results of his blood test done before taking the herbs (1 June 2010) and two and three months after taking the herbs (19 August 2010 and 9 September 2010). The energy was more balanced in August as compared to July 2010 (Figure 4). June (not real name) was 42 years old when she was diagnosed with ovarian cancer in December 2006. A TAHBO surgery was performed. The histopathology report confirmed a bilateral ovarian adenocarcinoma with metastasis to the omentum. June underwent six cycles of chemotherapy. At the same time she was started on CA Care herbs. Unlike other patients who did not take herbs, June did not suffer from the chemo side effects. One evening in June 2010, June vomited and had to be hospitalized. Two hours before vomiting, June was in perfect health. Her problem started after she ate a packet of nasi briyani. While it the hospital, June was initially told by her doctors that her problem was due to urinary infection. Later the doctors said based on their experiences this was a recurrence of her cancer. June was asked to undergo chemotherapy immediately. She declined. After ten days in the hospital, June was discharged and she immediately came to Penang and was started on the e-Therapy. She regained her health again. 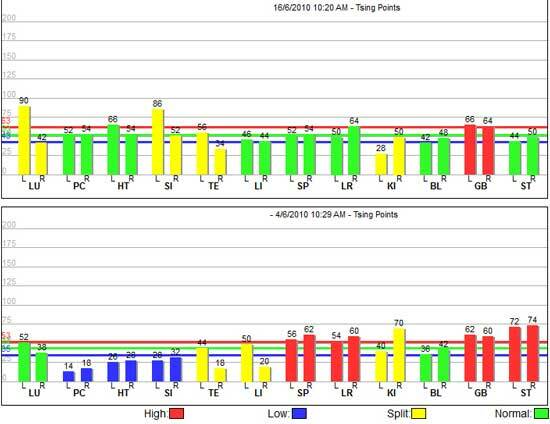 Below are her meridian readings done on 4 June and 16 June 2010 (Figure 5). The yin/yang, Upper /Lower and Left / Right energy were more balanced on 16 June 2010 compared to readings taken on 4 June 2010 (Figure 6). This is what we do at CA Care. Patients would have their meridian energy read using the AcuGraph 3 on their first visit to us. This will establish a base line or reference. Subsequently, every time patients come to CA Care they would have their meridian energy read. We would be able to compare the results of their meridian energy over a period of time. Our study thus far has shown that AcuGraph, when used and interpreted properly, could be another non-invasive tool for monitoring a patient’s progress. 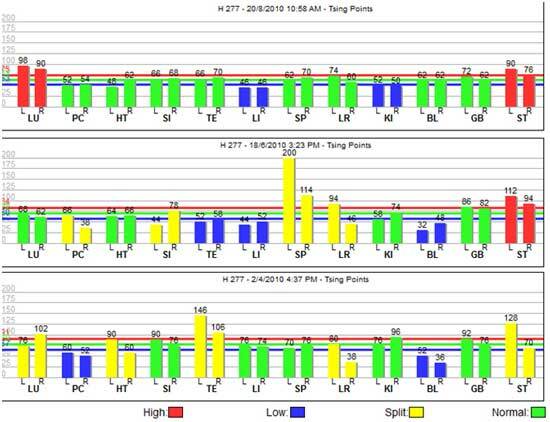 If feeling “better “ or “more cheng sin” (has more energy); is not good enough then seeing the coloured bars produced on a computer screen would be more convincing. 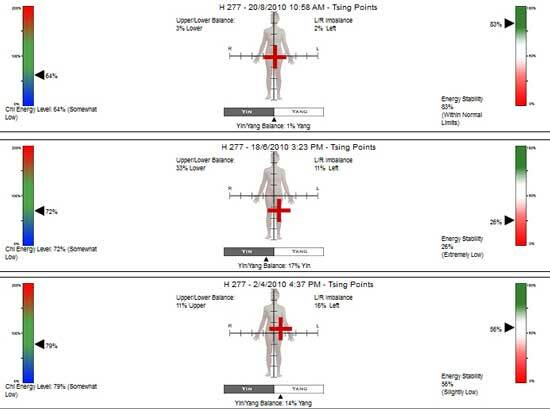 In all the cases above, the patients confirmed that they felt better, their blood test results showed marked improvements and likewise, the AcuGraph readings recorded improved energy balance. Truly this AcuGraph is a state-of-the-art, objective method of evaluation. Acknowledgement: We record our sincere thanks to Dr. Adrian Larsen, President of Miridia Technology Inc., USA, for his generosity in providing a unit of AcuGraph 3 for our research at CA Care. Since CA Care does not need to pay for this device, meridian reading at CA Care is done free-of-charge.